You can check on your qualifications by clicking the link above the table that says "View Your Current Coaching Qualifications". If you need to register for a Coaching Clinic, click the button that says "Upcoming Clinics" and you can see what is available and then register. If you are having problems with any of these drop me an email or call me. 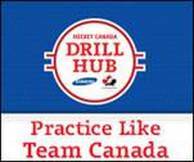 If you need more information regarding the coaching requirements, please use the buttons below to go to the Hockey Alberta or Hockey Canada website that will provide that information to you. If you want to be a Coach for the upcoming hockey season 2018/19, please fill out the below application and bring to one of the registration nights or email completed form to the registrar. Past coaches can complete online application. Click the button below, and you can follow the step by step instructions to register as a Coach, Assistant Coach, Trainer, etc. All coaches must complete the appropriate courses by November 15th in order to remain eligible for the remainder of the season. The button below links to a chart that indicates all required courses based on the age and level of athlete as well as coaching position. Click here for all available coach clinics. Click here to check your current coaching qualifications.